A sherry monster, the base is carefully wrapped with sherry and is guessed with difficulty, rather for some general sensations, but on the whole a fairly pleasant, thoroughbred, well-balanced mole with a rich palette of derivatives. Open, dry, spicy wood, solid furniture, stain, furniture varnish, caramel, citrus candied fruits, dried grapes, light sulfur-metallic notes, black tea (dry), prunes, fried nuts, sweet confectionery shades, licorice, dark chocolate. Saturated, light, tart oak, light bitterness of bark, pu er, dark beer, burnt crackers, leavened wort, metallic sour, sweet dried fruits. Light, astringent, lacquer notes with the bitterness of the young bark, pu er, grapes, burnt caramel, burnt biscuits, raisins, prunes, light sulfurous shades. Big sherry inside. Nose: nuts, raisins (a lot), chocolate and indeed a good hint of sulfur. From the nose it is expected to take a good dose of caramel once in the mouth. 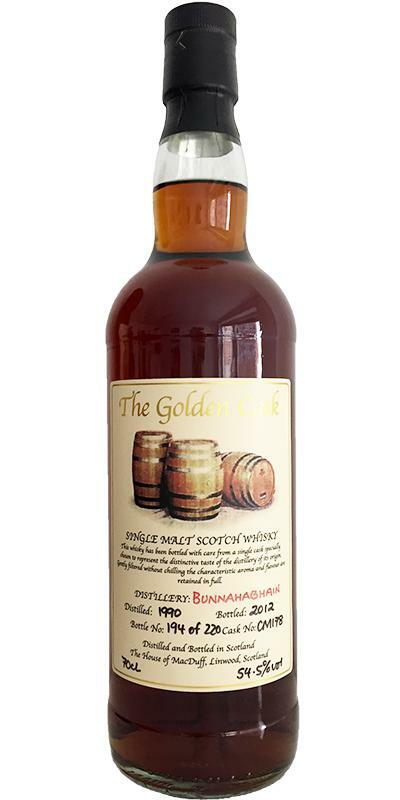 Palate: The alcohol is well integrated, with a texture that I love. It sticks to your teeth! We find everything on the nose, with a surplus of fruit compote. Black fruits. The whole is indeed very sweet, I will not drink a quarter of a bottle in the evening. Finale: The finish is long, on the walnut, the sherry. Back black fruits, blackcurrant thoroughly, at the end of the mouth. Very nice here! Overall, it's really expressive, but it's true that this small defect of suffering on the nose makes him lose a chouïa. To book at the time clearly sherry-sweet or we do not want too much finesse. Nose : A vivid sherry nose. Fruits (prunes, dates, oranges), coffee, chocolate. Some leathery notes and sulphur too. Mouth : Prunes, blackberries, dark chocolate, nuts, raisins and pepper. Finish : Long, pepper, dark chocolate, oak, drying. The black fruits strike back. Straightforward and so tasty. The sherry cask was very active here. Excellent. Boom: sherry, black fruit jam, a little wood, a lot of depth and a small note of sulfur. Very intense. In the mouth too, where we find all these aromas with a very thick texture, chewy, but caressing, never aggressive. Wrapping final. With a little water, you get a little caramel on your nose. A very nice sherry which we can not blame much except that it evolves little, he gives everything he has to reveal immediately. But it would be difficult! 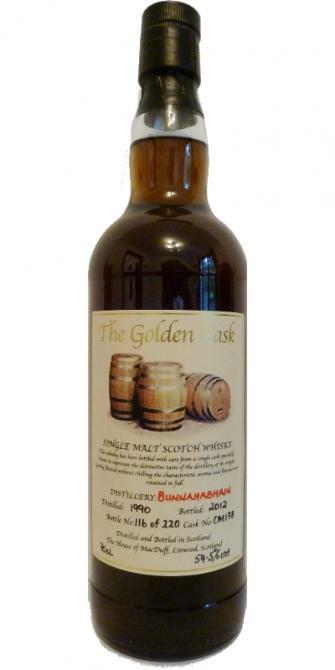 Bunnahabhain 1990-2012 The Golden Cask Color: very dark, dark amber, almost brown. If you like sulfur, you may enjoy this sherry monster. Personally I really do not like it and the nose is completely ruined. Caught up a bit by the mouth and the final happily. A good breath of sulfur. Leather, tobacco, cherry brandy. Gros boisé. Big sherry in the end. Chocolate first and foremost. Gourmand. Plum, orange, raisins. Wood and slight bitterness. Finale on chocolate, leather, and always a little sulfur, much nicer here than on the nose. Long and pleasant. This is nice and OK but too sweet for me, one dimensional and not complex enough. Plum, black mushrooms, chocolate, more and more honey with aeration, the dilution makes the nose more austere. Pleasantly viscous, sweet attack, nicely cooked caramel. Medium length finish, sweet and woody. Good. Big sherry influence with lots of aromatic chocolate and overripe blueberries. Some roasted coffee beans. Orange peel and a touch of sour sulphur. Heavy oak waiting behind all that. Powerful start. Heavy sherry at first. Then immeditely powerful old oak kicking in. Again some sulphur, giving it a very nice touch. Very spicy. Bitter sweet chocolate. Sherry lingerin on like forever. Not dry at all.